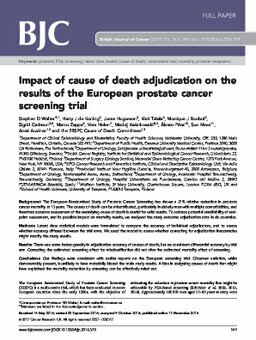 Background:The European Randomised Study of Prostate Cancer Screening has shown a 21% relative reduction in prostate cancer mortality at 13 years. The causes of death can be misattributed, particularly in elderly men with multiple comorbidities, and therefore accurate assessment of the underlying cause of death is crucial for valid results. To address potential unreliability of end-point assessment, and its possible impact on mortality results, we analysed the study outcome adjudication data in six countries.Methods:Latent class statistical models were formulated to compare the accuracy of individual adjudicators, and to assess whether accuracy differed between the trial arms. We used the model to assess whether correcting for adjudication inaccuracies might modify the study results.Results:There was some heterogeneity in adjudication accuracy of causes of death, but no consistent differential accuracy by trial arm. Correcting the estimated screening effect for misclassification did not alter the estimated mortality effect of screening.Conclusions:Our findings were consistent with earlier reports on the European screening trial. Observer variation, while demonstrably present, is unlikely to have materially biased the main study results. A bias in assigning causes of death that might have explained the mortality reduction by screening can be effectively ruled out.